Switchgears – they’re used by all, but most are ignorant about them! Why? Because we see them as devices too technical to understand, and leave decisions regarding them on our electricians. But what if you were given details – would you still choose to remain ignorant? Certainly not, right That is why I have stepped in – to help you out! To give you the information you have a right to have! Switchgears protect your electrical equipments, by regulating the flow of electricity within an electrical system. You can use them either to prevent overloads and short circuits, or to de-energize circuits for testing and maintenance. They can also be used as circuit breakers. There are various types of switchgears – ACCL, MCB, MCCB, RCCB, RCBO. The most familiar are circuit breakers and fuses which interrupt the flow of electricity to a circuit whenever the flow of current becomes too heavy. 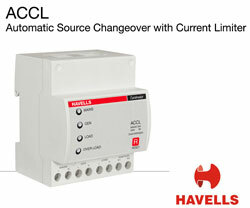 Today, I will be talking about ACCL – an Automatic Changeover Current Limiter. Trust me, functions and benefits are simpler than the name! Most of us are terribly affected by irregular power supply, and need alternative sources. This necessitates automation, in the distribution system, because if the change is made manually, the device may be damaged due to human error. This is when an ACCL comes into the picture! It’s a fully automatic high precision microcontroller based ‘Source Changeover’ device, which also has current limiting function and offers easy and ‘controllable’ automatic changeover between main power supply and generator supply. Which is especially beneficial when used with Electronic equipments. Its current limiting capabilities are ideally suited to the efficient utilization of the standby generators frequently used in multi-storied apartments, commercial complexes, etc. • Inbuilt Switched-Mode Power Supply (SMPS) for low power consumption. • Provision for manual reset for restoring supply when the device is in sleep mode. • Staggered terminal design with bottom wiring, for better isolation between phase and neutral. • Automatic generator on/off facility is added on special demand. a. The ACCL allows unrestricted supply from Mains in case current is in allowable limits. b. If the current exceed the mains rating, the load is disconnected for 8 seconds as a warning and then automatically reconnects it. During this period, the consumer is expected to switch off the non-essential loads and brings it within the limit. c. In an unlikely event, if the consumer does not switches off the non-essential loads to reduce it to within the limit, supply to the load from the mains is automatically disconnected after 5 cycles of interruptions. d. The supply from mains to the load can be restored after pressing the reset button present in the front of ACCL. Without AGS (automatic generator start features) – When the mains supply goes OFF, a consumer is automatically connected to the generator in case generator supply is available after a time delay of 8 seconds in order to limit the sudden load on the generator. With AGS (automatic generator start features) – ACCL Provides signaling through a potential free contact for starting the Generator (Generator must have control unit for auto Start/off) and then consumer is automatically connected to the generator after a time delay of 8 seconds in order to limit the sudden load on the generator. a. ACCL limits the user from drawing excess load current beyond the pre- set limit. b. If the current exceeds the limit, the load is disconnected for 8 seconds as a warning and then automatically reconnects. During this period, the consumer is expected to switch off the non-essential loads and reduce it within the limit. c. In an unlikely event, if the Consumer does not switch off the non essential loads to reduce it to within the limit, supply to the load from the mains is automatically disconnected after 5 cycles of interruptions. d. The supply from mains to the load can be restored only after pressing the Reset button present in the front of ACCL. Hopefully, the next time you are out shopping for electrical appliances, you’ll remember exactly why you need an ACCL! If not, you can always get back to me with your doubts! Till next time, goodbye from Elex, your Electricity Expert!